No one went to the Old Garden, as the family called it. The people on the Ridge called it the Witch-child’s Garden, though not often in my hearing. I wasn’t sure whether “witch-child” was meant to refer to Malva Christie herself, or to her baby boy. Both of them had died in the garden, in the midst of blood—and in my company. She had been no more than nineteen. I never said the name aloud, but to me, it was Malva’s Garden. For a time, I hadn’t been able to go up to it without a sense of waste and terrible sorrow, but I did go there now and then. To remember. To pray, sometimes. And frankly, if some of the more hidebound Presbyterians of the Ridge had seen me on some of these occasions, talking aloud to the dead or to God, they would have been quite sure they had the right name, but the wrong witch. But the woods had their own slow magic and the garden was returning to them, healing under grass and moss, blood turning to the crimson bloom of bee-balm, and its sorrow fading into peace. Despite the creeping transformation, though, some remnants of the garden remained, and small treasures sprang up unexpectedly: there was a stubbornly thriving patch of onions in one corner, a thick growth of comfrey and sorrel fighting back against the grass, and—to my intense delight, several thriving peanut bushes, sprung up from long-buried seeds. I’d found them two weeks before, the leaves just beginning to yellow, and dug them up. Hung them in the surgery to dry, plucked the dry peanuts from the tangle of dirt and rootlets, and roasted them in the shell, filling the house with memories of circuses and baseball games. And tonight, I thought, tipping the cooled nuts into my tin shelling basin, we’d have peanut butter and jelly sandwiches for supper. Return to my official webpage for GO TELL THE BEES THAT I AM GONE for links to information and more Daily LInes (excerpts). I first posted this excerpt (Daily Lines) on my official Facebook page on March 6, 2019. 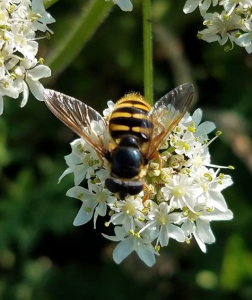 And thanks to Shelley Worden Trotter, for sending her lovely bee photo–taken on Culloden Field. This text is copyright © 2019 by Diana Gabaldon. All Rights Reserved. You may share the link to this excerpt, but please do not copy and paste the entire text and post it elsewhere.Thank you. This BEES excerpt was last updated on Monday, March 25, 2018, at 2:35 a.m. (PT) by Diana’s Webmistress.